— This article by Jerry Cates, first published on 17 April 2010, was last revised on 24 April 2016. © Bugsinthenews Vol. 11:04(09). Most spiders native to North America will bite humans if circumstances are right, and most of these will, in the process of biting, inject venom into human skin. One family of spiders–the hackled web orb weavers (the Uliboridae)–lacks venom glands and the associated venom delivery ducts in their fangs, but all other spiders possess both. Despite this sobering fact, the venom of most spiders rarely pose a serious danger to most humans or their pets, primarily because the typical spider venom (in contrast to the venom of the black widow, the recluse spiders, and a few others) does not usually produce medically-significant reactions in human tissue. Secondary infections from microbes in the venom or that contaminate the bite wound are always possible from any spider bite. Furthermore, some humans are more susceptible to spider venom than others, and may experience allergic reactions or other manifestations that reflect their unique genetic makeup, physiology, and state of health. Certain microbes, including the highly infectious Staphylococcus aureus bacteria (particularly virulent strains of which are now resistant to a number of common antibiotics such as methicillin and are thus known as multi-drug or Methicillin-resistant Staphyloccus aureus, or MRSA), produce infections at the sites of arachnid and insect bites that mimic the tissue necrosis associated with brown-recluse spider bites. 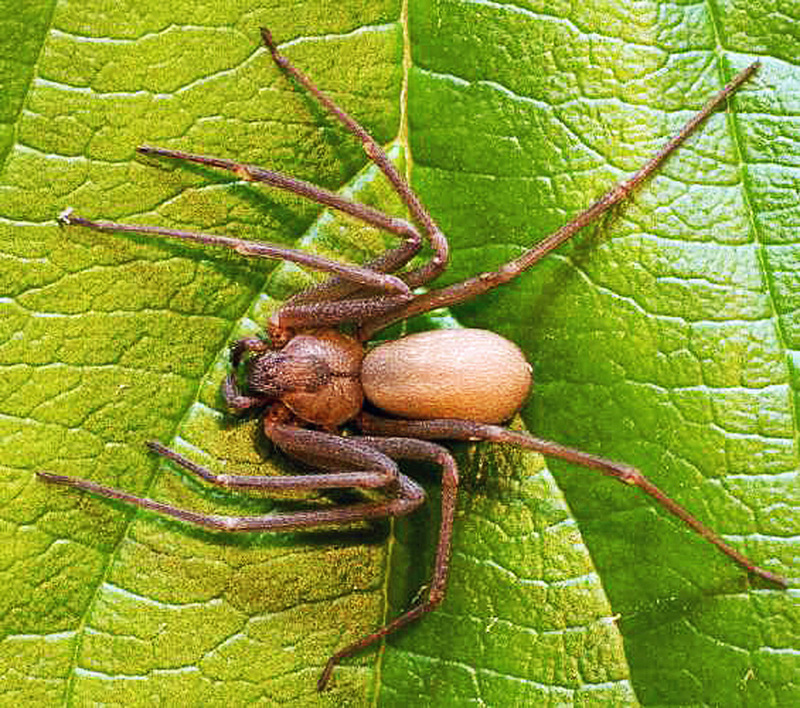 Some investigators have estimated that more than 80% of the reported brown recluse spider bites in the U.S. are actually caused by other organisms, or by microbial infections. Whenever a spider bite occurs, even if the spider is known to be among those whose bite is not normally considered dangerous, it is generally wise to capture and preserve the offending spider–or its remains, if it has been killed–for future analysis. When this is done, the outcome of the bite event is much better all around, not only for the person who is bitten (because the added knowledge aids in securing the best treatment available), but for the medical and scientific community (which benefits from the increase in information that comes from being able to connect a specific bite to a known cause). Most spiders captured alive, in glass jars with tight fitting lids, can usually be kept alive for one or two days–without suffering any ill effects–if placed in a cool, dark place (including a refrigerator, provided temperatures remain above freezing). Spiders that have been killed, even if they have been severely mashed in the process, can still be identified by an experienced arachnologist with access to a dissecting microscope; dead spiders can be scooped into any convenient container for retention, though a small glass jar filled with alcohol and capped with a tight fitting lid is best. A number of spiders common to North America are known to bite humans without causing medically significant wounds. 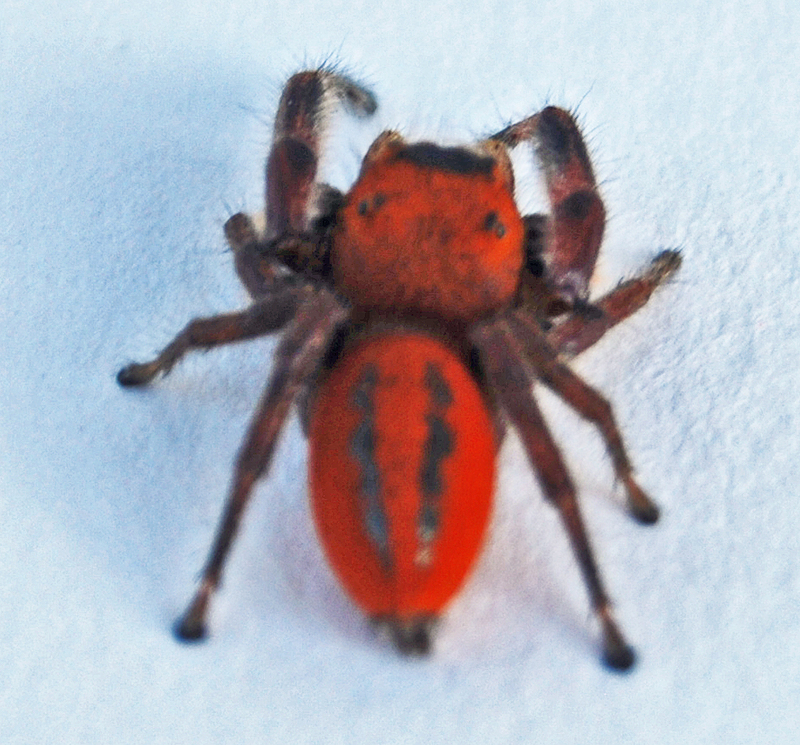 The jumping spiders in the family Salticidae are notoriously aggressive, and often bite without provocation. Others, including wolf spiders and some orbweavers, only bite humans defensively. Most North American spiders, when they bite humans, either leave no signs, or produce only minor swellings or sores that resolve in hours or days without complications. For a spider bite causing systemic symptoms, like diminished mental capacity or confusion, difficulty breathing, profuse sweating, cramps, high blood pressure, or the like, emergency medical assistance should be sought immediately. As mentioned earlier, because practically all spiders bite with fangs attached to venom glands, their bites result in the injection of foreign substances into the skin. Thus, secondary infections from bacterial or viral contaminants–in the venom itself, or on the skin of the person bitten– are possible, though reports of such secondary infections are scarce. The chemistry of the venom, and of the venom gland and lumen, may militate against the colonization and growth of most bacteria and viruses within the venom itself. All spider bites should, however, be examined for secondary infection and, if signs are observed, competent medical assistance should be sought as soon as possible to limit the spread of the infection. Some North American spiders, including, but possibly not limited to, the Black Widow (Latrodectus mactans) and Recluse spiders in the Sicariidae family, produce bites that typically–the Black Widow–or sometimes–Recluse spiders, particularly the Brown Recluse (Loxosceles reclusa)–cannot be resolved except with the assistance of competent medical intervention. 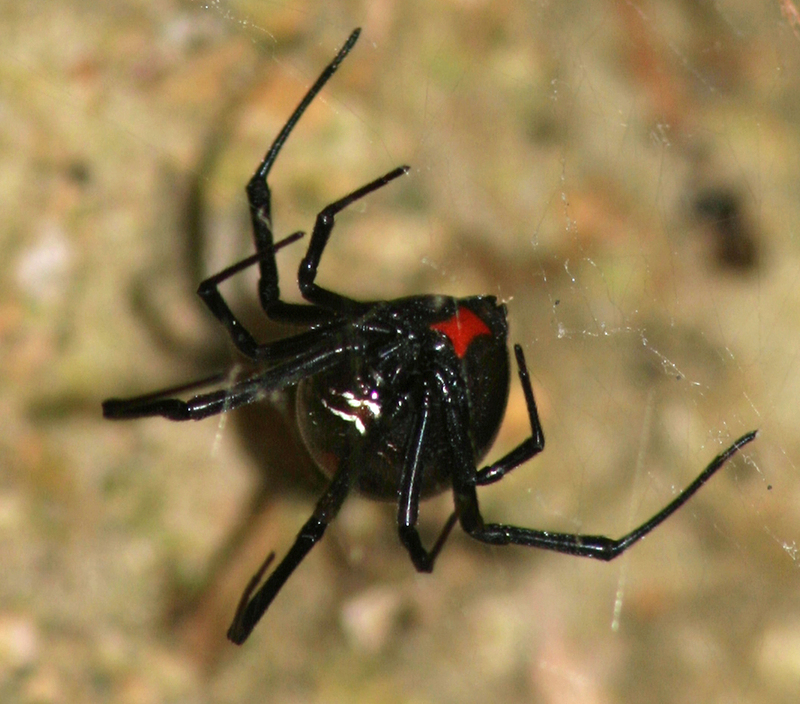 In North America, only the bite of the black widow typically produces acute, immediate symptoms in humans. These symptoms usually surface within minutes or hours after the bite occurs. Although fatalities from black widow bites are rare (less than 1% overall, but higher in children, the elderly, and those with compromised immune systems), a black widow bite should always be considered a serious medical emergency. For the most part, first aid outside a medical setting is nonexistent, though oral administration of calcium gluconate tablets may offer some relief. The bite of the black widow may not be painful. Often the bite is not noticed when it occurs. Pain begins from minutes to an hour later, concentrated in the lymph nodes and spreading from there to the musculature. Blood pressure increases, as does heart rate and body temperature. Cramping and rigidity of the abdominal muscles are diagnostic, though similar symptoms are produced by puss caterpillar stings. Facies latrodectismi, a medical condition wherein the face is flushed, with profuse sweating, swollen eyelids, inflamed lips, and involuntary cramping of jaw muscles, is uniquely diagnostic. If cramping spreads to the chest, and affects breathing, the danger of fatal asphyxiation increases. In addition to physiological symptoms, psychological symptoms are also common. Persons suffering from black widow envenomation often experience significant anxiety episodes, including fear of death. Without treatment of a black widow spider bite at a medical facility, death is possible, and severe, painful symptoms may last up to five days followed by several weeks of recovery. With medical intervention, typically involving narcotic pain relief, intravenous administration of calcium gluconate, and administration of black widow antivenin, pain remediation and relief of cramps can occur within minutes, with full recovery in a matter of hours. For individuals located some distance from medical facilities, oral administration of calcium gluconate may help with muscle cramps. Though some authorities deny any benefit can be obtained via this route, it offers the possibility of some relief if nothing else is available. Besides the human reactions to Black Widow venom described above, other animals suffer react in different ways. Dogs, for example, are much less susceptible and tend to shrug off a Black Widow bite with few or no symptoms. Horses, cows, and sheep, however, tend to be extremely sensitive to Black Widow venom. For this reason, barns housing horses, cows, or sheep should be regularly inspected for Black Widow spiders, and steps should be taken to immediately exterminate those that such inspections reveal. The bites of some recluse spiders (and perhaps several other spiders, some not yet fully recognized), produce necrotizing (tissue death) wounds. Progressive necrosis is said by some to take place over a period of days, weeks, or months. What we know for sure: The wound initially forms as a small lesion that appears as a blood blister. This lesion expands as a reddened, slightly swollen sore. During wound development, the necrotic center of the lesion turns blue, surrounded by a pale ring of vaso-constricted tissue, which is surrounded by a reddened ring of erythematous (inflamed) tissue. 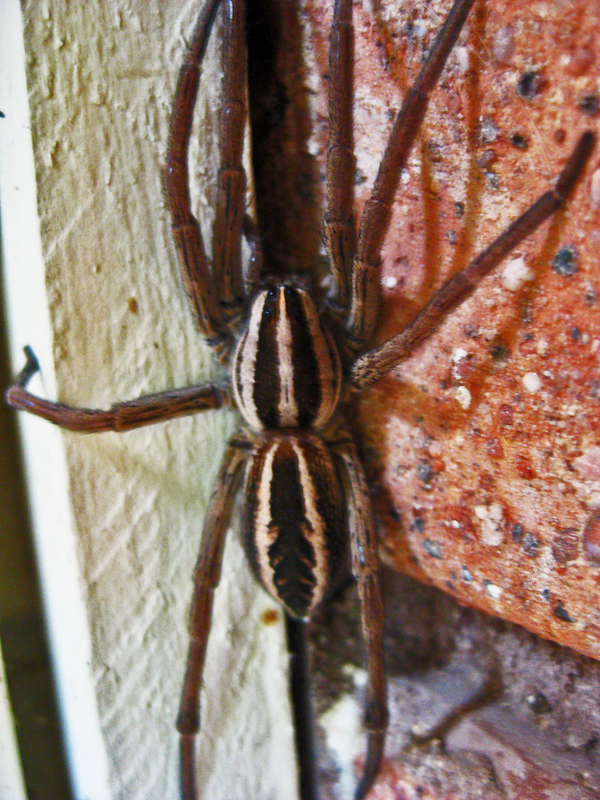 This produces a characteristic bulls-eye pattern typical of ordinary loxoscelism (envenomation by a recluse spider). The controversy: Most medical authorities in the U.S. today recommend that persons noticing such a pattern of wound development, following an observed bite by a recluse spider, seek medical attention immediately. This advice proceeds from the stated belief that lesions caused by recluse spiders tend to grow more extensive over time, heal slowly, and lead to widespread tissue damage. First aid for recluse spider bites, outside a medical setting, is considered worthless by these authorities. Other authorities disagree. Some doctors challenge the traditional view described on the previous page. They argue against certain traditional treatments for such wounds, particularly (1) administration of antibiotics without proof that an infection exists, and (2) indiscriminate debridement of necrotic tissue as a means of hastening wound healing. Similarly, a number of distinguished entomologists and arachnologists are troubled by the tendency of medical professionals to automatically classify necrotic wounds of unknown etiology as recluse spider bites, arguing that the misdiagnosis of infections as spider bites is a common problem that leads to inappropriate patient care. Studies in the U.S. and abroad have shown that, absent firm proof that the wound was caused by a spider, the likelihood that it was actually caused by a spider is no greater than for any of a wide list of alternate causes, including infections secondary to animal bites or scratches, insect bites from fleas or mosquitoes, or nosocomial/community-associated MRSA (methicillin/multidrug resistant Staphylococcus aureus) acquired from a variety of sources. These concerns are more than academic. Recluse spider bites introduce an essentially sterile venom, albeit one that includes the enzymes sphingomyelinase-D and hyaluronidase, with a limited ability to produce chronic wound development. The value of antibiotics in the treatment of such wounds is questionable. Infections by microbials, though, reproduce in the patient’s body, and often present as a constantly progressive disease and the application of antibiotics serves a primary role in treating such wounds. Treatment regimes for spider bites should, for this reason alone, differ from those applied to bacterial infections because, if these become confused by medical professionals responsible for wound care, the patient suffers. The confusion factor is compounded by the superficial similarities between venom necrosis caused by recluse spider bites and the tissue necrosis observed in patients infected with MRSA. Localized MRSA infected wounds often have the same bulls-eye pattern that characterizes recluse spider bites. This happens because both produce tissue death at the wound site. Other than that, however, the two are nothing alike. Studies of actual recluse spider bite cases indicate that the progression of the necrosis caused by a recluse spider bite is limited to the first 18-24 hours after the bite event, whereupon further necrosis ceases. Afterward, the wound begins, albeit slowly, to heal. By contrast, the progression of MRSA necrosis continues for as long as the necrotizing microbe remains viable. Because MRSA resists traditional antibiotic regimens, the wounds it produces may become quite large before the necrotic agent, often in the form of a live, multidrug resistant strain of staphylococcus aureus, is brought under control. So, how likely is a medical professional to misdiagnose a MRSA infection as a recluse spider bite? Pretty likely, according to the papers published by a number of researchers on the subject. G. B. Edwards, for example, published a study on this subject in 2001 which showed that, while doctors reported 96 recluse spider bites in the Tampa, Florida region in the year 2000, no brown recluse spiders have ever been collected in the Tampa area. Furthermore, no other spider whose bite is known to produce similar lesions has been found in that geographic area, either. This suggests that most, if not all, of these cases were in actuality MRSA or similar microbial infections. However, because many, if not most, medical professionals treat suspected recluse spider bites with antibiotics, without first culturing the wounds to determine the microbial fauna populating the wound prior to treatment, it becomes practically impossible to pinpoint the primary cause of the wound later on. This kind of misdiagnosis and treatment procedure is not uncommon in other parts of the U.S.
“I have personally identified several hundred Florida spiders submitted for identification by the public, and only one specimen… proved to be a brown recluse spider. In addition, I have seen thousands of Florida spiders submitted by professional biologists and inspectors, with only [a] few specimens… proving to be members of the genus Loxosceles. It appears obvious to me that the chance of interaction between brown recluse spiders and people in Florida is close to nil, agreeing with Vetter’s (2000) assessment of reported brown recluse bites outside the natural range of the spider. Medical personnel should, therefore, consider a multitude of more likely causes… before diagnosing and treating a necrotic wound as a brown recluse bite.” G.B. Edwards, 2001. Note his language: “…before diagnosing and treating a necrotic wound as a brown recluse bite.” This finding is consistent with similar conclusions arrived at by other researchers who have undertaken detailed lab and field studies on this subject. Yet, for some reason, medical personnel throughout the U.S. tend to classify a necrotic wound as caused by a spider bite, even when, from the available evidence, the likelihood that a recluse spider is the culprit is remote. Is it because they are in a hurry, and don’t have time to make a proper diagnosis? If so, maybe… just maybe… it’s time to slow down and do the job right. At least that’s the humble opinion of this observer. Does it matter if the cause is misdiagnosed? The answer appears to be a firm YES, it does matter whether a necrotic infection is misdiagnosed as a recluse spider bite, and vice versa. One is caused by a sterile venom, the other by an infectious microbe. Though the two may appear to produce similar kinds of wounds, they are quite different. Those differences demand that different treatment protocols be applied. For example, antibiotics appropriate for treating microbial infections are generally inappropriate for venom necrosis. The evidence indicates that many more microbial infections are misdiagnosed as recluse spider bites than the other way around. In recognition of this, many physicians routinely prescribe antibiotics at once to patients with necrotic wounds. This occurs despite the knowledge, within the medical community, that overuse of such antibiotics accelerates the development of resistant strains of bacteria. This is, in my opinion, a gross misstatement of fact, though these or almost identical words are often spoken by experienced entomologists and medical personnel who — one must presume — are simply not familiar with arachnid anatomy. Most spiders are quite capable of biting humans. Very few have fangs that are “too short” to break human skin. Mere shortness of fang, in fact, is not likely to be a serious impediment, for any spider, to envenomating humans, because human skin–particularly on small babies and elderly adults–can be quite thin and easily broken. As for the supposed fragility of the typical spider fang, it happens that many if not most spiders use their fangs as pliers for grasping. This faculty is so typical that spider chelicerae are often referred to as the spider’s “hands” (see Rainer F. Foelix, Biology of Spiders, 2nd Ed., 1996, p. 15). Many spider fangs also have cuticular teeth that enable them to masticate their prey, and most without such teeth (e.g., the thomasids) are well known for their ability to bite humans. However, irrespective of this misstatement, it remains true that the venom injected by most spiders does not generally produce medically significant conditions in humans and that appears to have been the thrust of the point that Dr. Kelly was projecting. Spider Bites in Barracks, by Rick Vetter, et al. I am afraid that i have both those spiders loose in my home and I need to know if there is a way to keep them out, maybe with a chemical. I have a one month old newborn that I am afraid might be bit by these terrible spiders. Please Help if you can. Editor’s Note: Karalee, congratulations on your newborn baby. On this Father’s Day I remember well how proud I was to be a new father, over 40 years ago. You don’t mention where (city and state will do) you are located. Nor do you mention what makes you believe you have both black widows and brown recluse spiders in your home. If you have a digital camera, take photos of the spiders that you find that you believe are dangerous and send them to me at jerry.cates@entomobiotics.com as email file attachments (full resolution is best). I will examine the photos and tell you whether they are spiders that you should be concerned about. Spiders are a natural part of life, and 99% of the spiders found in most homes and yards are beneficial organisms that do more good than harm. However, if you do happen to have black widows or brown recluse spiders, you have a legitimate concern that needs to be dealt with intelligently. Having a newborn baby adds some urgency to the issue, too. The problem is, introducing pesticides into your home can be more harmful to the baby than the spiders. So let’s do this carefully, one step at a time, by first finding out what kind–and how much–of a spider problem you really have. I live in Phoenix, AZ and we have a lot of black widow spiders here, but I don’t think we have brown recluse spiders. Thankfully I have never been bit by a black widow and hope to keep it that way. I read that one of our hospitals has an experimental antivenin, but I really don’t ever want to need to use it. I have cows, and they get spider damage around their shoe. What can I use to avoid that to happened and how I treat the damage?? my daughter and I were going through clothing from our shed and she saw a spider on the floor. and then she told me she felt something a few mins ago. I caught the spider. it is really dark at the head and really pale at the but area but has a patter in the but such as a plant leaf shape. part is darker and then lighter. its legs are almost see through and it is no bigger than a nickel. probly fit on a penny. the finger she thinks she got bit on is tingly and no markings at this time. I can not find what kind of spider it is can you help. Francisco: are you certain the injury to your cows is caused by spiders? Many other sources of such injuries exist, and of those spider bites are at the bottom of the list.